To alum or not to alum? A couple of years ago, Leisureguy turned me on to the the use of alum block immediately after shaving, as an astringent. I loved it and have used it ever since. It not only closes the freshly irritated pores of the shaving “landscape”, but it’s a great litmus-test of how good a shave you got; the more it tingles, the worse your technique, razor, and/or soap performed. But as a shower shaver, the problem with using a raw alum block is that it literally melts away in the water that’s always left on the shelf where the block rests. And as it’s slowly deteriorating it also gets very rough, making it quite scratchy to use. No longer. Fendrihan.com now carries pure potassium alum in a deodorant-like dry roll-on with a base and cap. 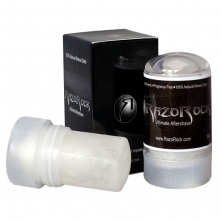 The roll-on is made by RazoRock, and is very nicely packaged. I’m not sure I’ll use the cap since it might not be a great idea to trap the moisture, but rather to let the exposed alum dry off in the air. But the base should certainly prevent the usual breakdown from sitting on the wet shelf. We’ll see. Alum is very easy to use. At the end of your shave, after you’ve rinsed off the last vestiges of soap, simply pass the alum block over the shaving terrain (I’m into using Method shaving terms such as landscape and terrain today), then rinse off one last time with very cold water. Your face will feel amazing. My alum block died a couple of shaves ago and I’ve missed it terribly (until my Fendrihan order arrived yesterday! ).